On September 15th, the Municipality of Stanstead hosted its annual event, Septemberfest at the Stone Circle. This was a wonderful opportunity for the community to get together to enjoy a live band, campfire, inflatable games and activities for children, fireworks and much more! This year, the Town collaborated with Phelps Helps to congratulate the 25 local high school graduates from the 2017-18 school year. Our mayor, Philippe Dutil, presented the names of each local graduate, 6 of whom were present (see photo). 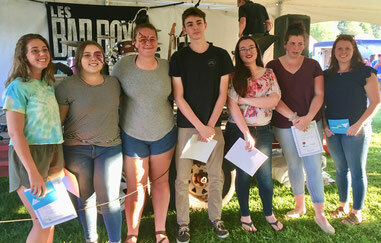 Graduating high school is a big step and something to be very proud of, which is why this opportunity to recognize the students at a community event was very important to both the Municipality of Stanstead and Phelps Helps. Contact our Education and Career Advisor, Elizabeth Courchesne by email ecourchesne@phelpshelps.ca or find her on Facebook, for more information or to set up an appointment!